Right size. When scouting locations for your new business, size matters. Real estate installation cost, market demand, and local building codes will shape your investment choices. Location services. IHA will help you find the model size, and capacity that meets your investments goals and location specifications. We will help you explore your market’s potential, and help you find the best real state location. Maximize potential. 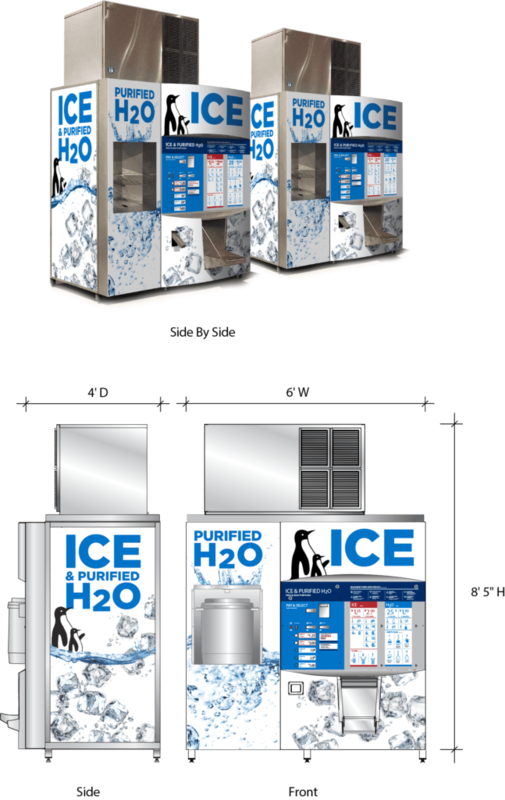 IHA’s three models of ice & water vending machines allow you to maximize the earning potential of your location. Your vending business can become a destination that you can grow over time, or your existing location can be expanded to maximize earning potential. It is up to you. IHA provides you that flexibility. The Ice House model was IHA’s first vending machine model. Capable of holding 6,500 lbs of ice, it is the best in its class. It is ideal for busy business centers or other high traffic locations. Optimal for high traffic locations. Our largest ice vending machine model. Offers a choice between bagged or direct-to-cooler ice. Has several payment options: cash, vend coupons, credit/debit, or tokens. Can serve up to 50,000 customer visits per year. 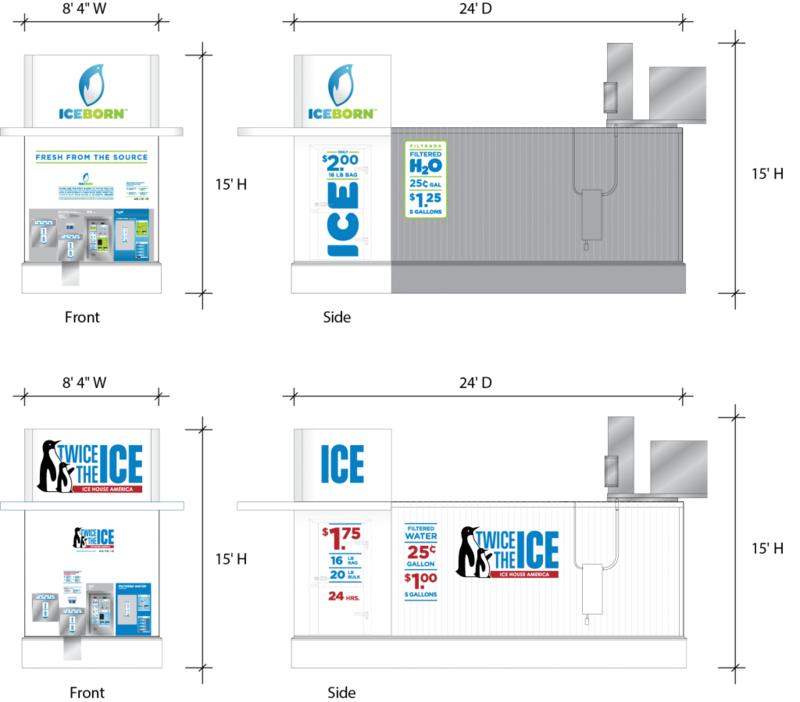 The Ice Kiosk is our mid-sized model, combining the appeal of the Ice Express with the reliable internal components of the Ice House. 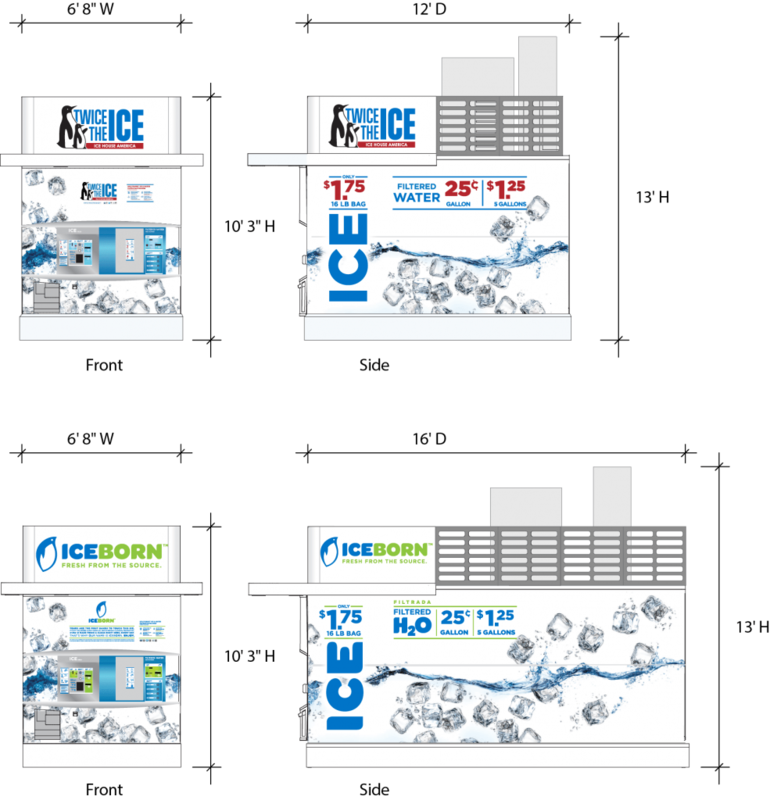 The Ice Kiosk is versatile because it offers different ice bin capacity options and the choice to use either 1, 2, or 3 ice makers. The Ice Kiosk is perfect for smaller locations that cannot fit the Ice House model. Optimal for medium to high traffic locations. Choice between 2,500 lbs. and 3,000 lbs. bins. Ice and water vending come standard. Sediment filtration, water softener, and carbon filtration included in filtration system. Backlit structural awning and ice maker screen included. SmartIce™ Remote Management System included. The Ice Merchant is designed with the versatility to support an existing retail business or operate as a free standing ice and water retailer. It’s popularity has grown businesses such as convenience stores, campgrounds, grocery chains, car washes and savvy entrepreneurs. Comparing in size to a traditional ice merchandiser, the Ice Merchant is the perfect fit for improving the customer experience and offering a premium product 24/7. Can be placed inside or outside.